For red layer: Pour water and sugar into a small saucepan, sprinkle with unflavored gelatin and allow it to soak in a minute or two. Heat on medium-low, stirring constantly until gelatin and sugar dissolves. 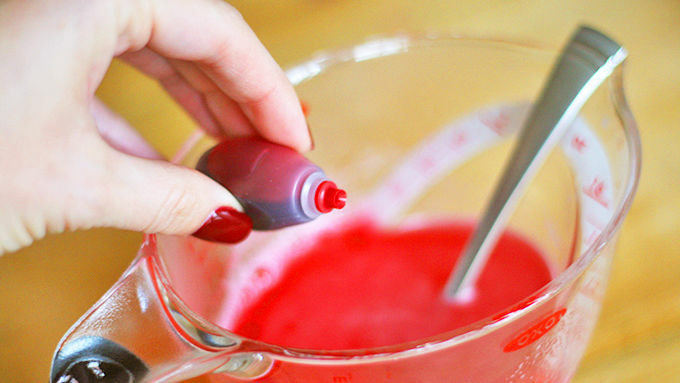 Stir in schnapps and enough red food coloring to achieve desired color. Set aside. For white layer: Pour water into a small saucepan and sprinkle with unflavored gelatin and allow it to soak in a minute or two. Heat on medium-low, stirring constantly until gelatin dissolves. Stir in rum and sweetened condensed milk. Place shot glasses at an angle in a muffin pan. Begin by spooning a couple teaspoons of red gelatin into each glass. Place in refrigerator and allow to partially set, about 20 minutes (it should no longer be liquid, and you should be able to lightly touch the surface with your finger). Next, add a little of the white gelatin to each glass. Replace in fridge until partially set, about 20 minutes. Repeat this process until you have the desired amount of layers. For the last layer you can sit the glass upright. Allow to set completely in fridge another 2-3 hours at least (or overnight). 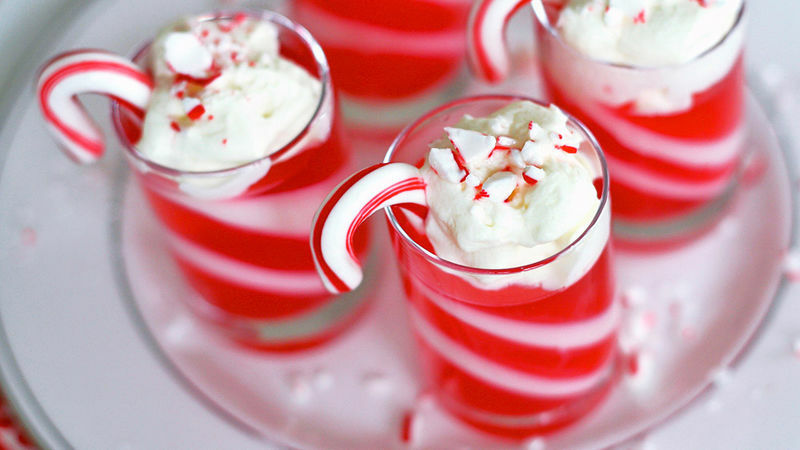 When ready to serve, insert a mini candy cane into side of each glass and top with whipped cream and crushed candy canes. 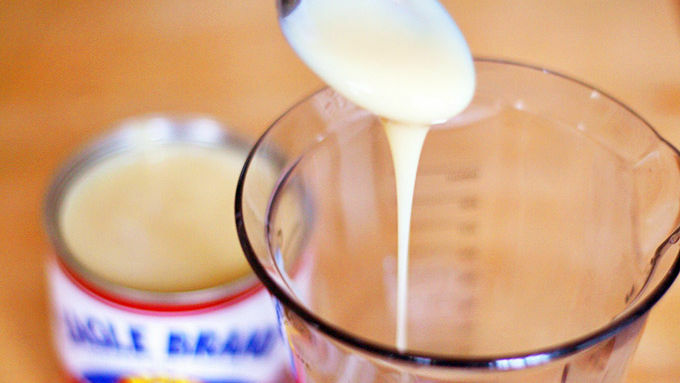 Freeze any unused sweetened condensed milk for a future recipe. 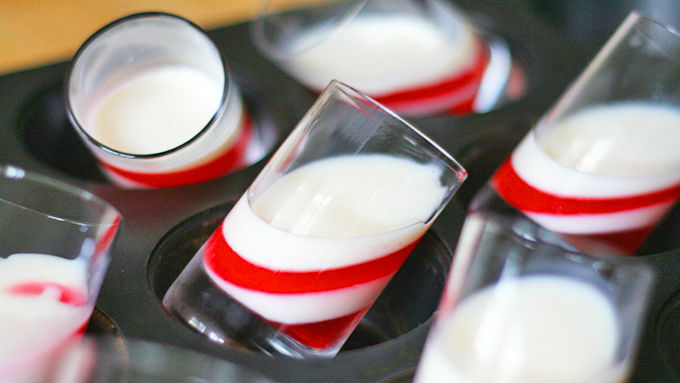 Get your peppermint fix with these sweet holiday jelly shots. Forget about leaving Santa cookies and milk this Christmas. 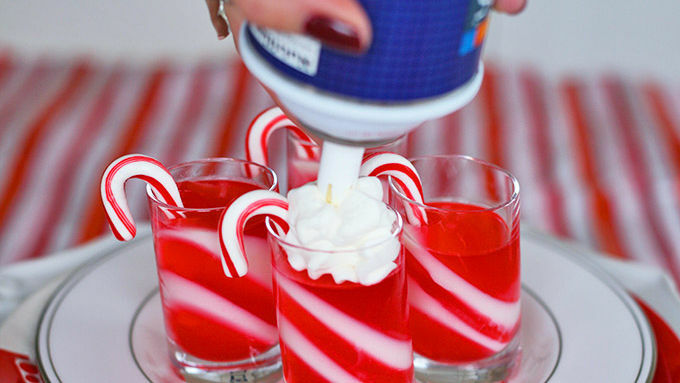 He will LOVE these candy cane jelly shots! Rudolph may have to drive the rest of the way, but you will definitely have the best presents under the tree. For garnishes, use whole mini candy canes and little pieces made by crushing a few canes inside a plastic bag. When ready to serve, insert a mini candy cane into the side of each glass and top with whipped cream and crushed candy canes. Ho Ho Happy Holidays! !